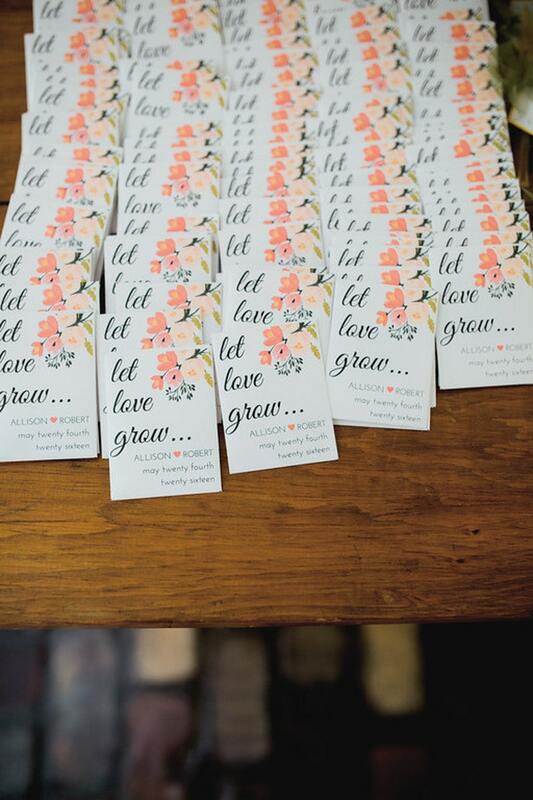 These seed packets are the perfect favor for every wedding theme. 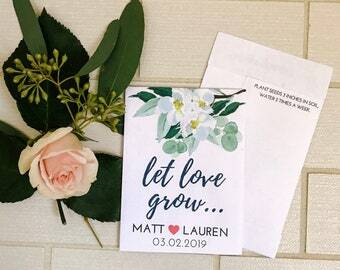 Guests will have something that they can take with them to remind them of your special day. 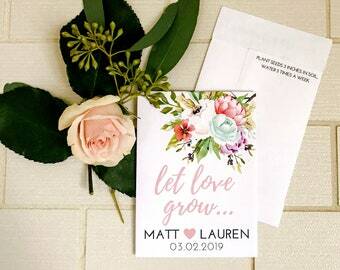 *Please include names and date of wedding or event in the 'Notes to Seller' portion of the order form. *As standard: All seed packets have "Thanks for Coming" Printed on the top back flap. If you would like different or additional text please include this in the 'Notes to Seller' portion of the order form. *For design purposes the planting instructions will be placed under the top flap on each packet. *Please note that for design purposes, the shortest name is followed by the heart and the longer names, as it looks more centered on the packet. Please make note if you want the names printed in a specific order. Our goal is to make this the perfect addition to your wedding. Complete with wildflower seeds inside, and closed with gold washi tape. They measure approximately 4 inches by 3 inches. Please message me with any questions you have. 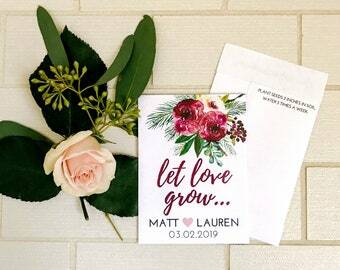 I am more than happy to customize for your wedding needs. Everything was exactly as expected and they came on time! Very cute. Very nice quality packets. I messaged the seller (pretty last minute) about a change I wanted to make and she was very accommodating. Would definitely buy from this shop again. What types of seeds are included in the packets? After I place my order, when can I expect my package to arrive? Your order will ship exactly 2 weeks after the order is placed, we ship with USPS and your order should arrive within 2-5 business days after it has shipped. If you need your order sooner you can purchase our expedited production & shipping listing and your package will arrive within a week. Can I order in quantities different than 50? *shipping price based on how many you order and where they are being shipped. Can I change the wording on the packets? We try our best to accommodate all text requests. Please message us with the desired wording and we will let you know if it will work. Also, note that more text means smaller font on the packets. We can provide a proof if requested. I live out of the United States will these go through customs? We ship out of the US quite often and have only had a few issues. Most have cleared customs, but we have had a few instances of them showing up very late, or our client never receiving them. We try our best to ensure delivery but once they clear USPS there is not much on our end we can do. Again, we have only had about 3 of these instances but it has been with orders shipped out of the US. Can I order the seed packets without seeds inside? We can absolutely send just the packets. You can just send us a custom listing request with the number of packets you would like and we can accommodate this request. We charge $ .75 per packet + shipping. Can I order just the honey stick tags? We can absolutely just send the tags, we charge $15 per 40 tags. Just send us a custom listing request with the amount you would like to order and the wording you would like on the tags. You must order at least 40 tags & in sets of 40! What are the dimensions of the seed packets? The seed packets are approximately 4 inches tall and 3 inches wide! Perfect to display and for guests to take home! How many seeds are included in each packet? Each packet has approximately 1/4 tsp of seeds. This is enough seeds to plant a 2ft x 2ft planter or smaller depending on how full you like the flowers to grow. If I purchase early, how long are the seeds in the packet good for? Because we seal each all seeds in a ziplock bag inside of the packet, these will stay fresh and plantable for 1 year+. We do recommend that you store them in a cool, dry, place until they are needed.